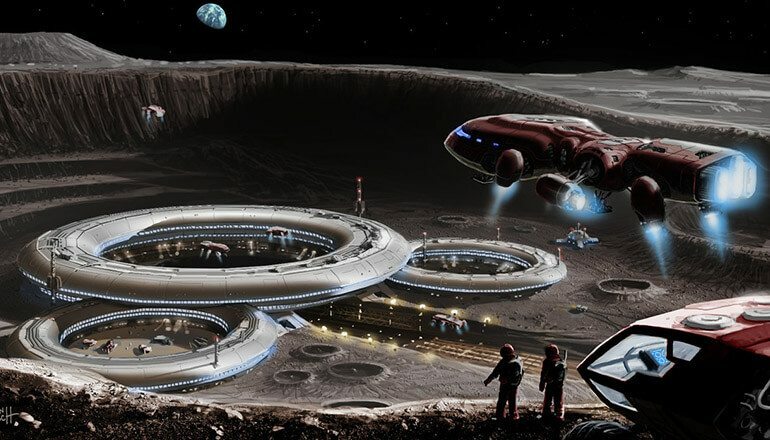 Contactee Alex Collier claims our Moon is actually the interstellar transport ship that was brought here from a distant solar system. It contained an experiment run by the grey aliens and their reptilian masters: our genetically-engineered ancestors. Fluke or not, most Sci-Fi writers proved to be quite visionary, if not somewhat prophetic. The book “Letters from Andromeda”, the brainchild of Job Robinson and Alex Collier describes a telepathic conversation with alien beings originating from the Andromeda Galaxy. An ancient being called Moraney from the constellation Zenetae, transmitted important information to Collier, questioning the lies spread in our history books. The Andromedan exposed the deceitful way humans are being ruled, the lies that govern our everyday lives without our consent or even awareness. We are being told nothing about the real concerns of real life, much less about what is actually happening in our Solar System. Moraney’s biggest revelation pertained to mankind’s true history and a secret base on the Moon. Earth’s satellite carried a vital role in our genesis, but far from any way we have been taught so. The Moon was brought from the constellation Ursa Minor – 432 light years from Earth – to serve as a transport ship for reptilians, human-reptilian hybrids and the first generation of human ancestors to descend on Earth. Our moon made its way in our galaxy dragged by an asteroid that is believed to cross our galaxy every 25,000 Earth years. Moraney also revealed that our Moon once orbited the 17th planet of the Chowta star system, home of the Andromedans. What we see today of the Moon, are in fact the remains of a 6.2 billion years-old cosmic vestige called Maldek, a reminder of the ancient war between the tyrannical Grey aliens of the Orion Empire. According to the information passed on to Collier by the Andromedan, we are here because we were brought here by an ancient extraterrestrial civilization surpassing our Sun in age. The craters on the Moon are a solid hint to a trained eye, for their depth does not match a straying cosmic body, but a uniform shape pressing against the layers of lunar dust and rock, but since we are alone in this galaxy, who is responsible for the so called craters? The answer comes from the Andromedan, who tells of cities and spacecraft hangars located on the far side of the Moon, that were destroyed in a war over 113,000 years ago, leaving behind the marks visible from our planet. The Greys guided the first exploration mission of these ruins back in 1950, when a team of NSA (not NASA!) astronauts allegedly delved into a lunar underground facility the size of New York, right underneath the Jules Verne crater. Inside the facility they found the remnants of a violent battle, seeing pieces of reptilian bodies scattered all over the place. Since then, the World Government maintained a lunar population program starting with 36,000 handpicked people. The colony is estimated to reach 600,000 occupants in the near future. The step below in the hierarchy are a group called the Blue Moon, who serve the Black Monks, comprised of American, British, Russian and French representatives. These groups operate and control the moon bases and under their command are two organizations: Alpha One and Alpha Two. Collier had reasons to believe that Alpha One was assigned with gathering resources on Earth and keeping the population unsuspecting. The Andromedan Moraney told Collier that Alpha Two is actually MJ-12, the infamous organization tasked with recovering and investigating alien craft. If this is true, the organization we believe to be in charge of such covert projects is actually at the bottom of the ladder, and said ladder runs much higher than we previously thought. To this day, Collier’s allegations have yet to be proven but completely rejecting their implications would be unwise. The far side of the Moon is forever hidden from view and even if a number of alien bases were located there, we wouldn’t be able to spot them from Earth. But Alex Collier is pretty adamant about his enlightenment and the forbidden knowledge he was blessed with by the Andromedans.